I started writing this as a document for a client, and it turned out to be a little longer than I was anticipating, so you can download the full version on PDF if you like. WordPress has historically been used as a blogging platform however now we are realizing its value as a content management system (CMS) for all types of websites. A WordPress-powered website consists of two main types of content: posts and pages. Posts are regular pieces of content that are added to your site, like news articles or blog entries. They all reside underneath the same page (usually the home page, or alternatively a separate ‘posts’ or ‘blog’ page). Posts are listed sequentially on the page, starting with the newest post at the top. Each post also has its own web page dedicated to that post. Users can add comments to your posts, which you then approve or decline. You can also reply to these comments. Individual posts have categories and tags associated with then. Categories are logical groupings of posts. Every post should be filed under a category to ensure your content is organized. For example, a news website might have the following categories: national, world, sports, business and entertainment. Tags are more specific indications about what the post might be about. Think of them like keywords. For example, a post under the sports category might have three tags: All Blacks, Wallabies and rugby union. Pages are usually updated less regularly and contain one lot of content on a single page. Examples of this might be an “About Us” page or a “Contact Me” page. You can update the content on these static pages whenever you like. It is always good practice to try and update all your content on a regular basis. The look and feel of a WordPress site is defined by the site theme. Various themes are available freely and can be customised, or can be purchased or developed specifically for you. The theme specifies visual features such as fonts, colours, background images etc. Themes ensure a consistent look across all pages of your website. Some themes have built in options so you can easily change fonts or colours with a click of your mouse. This lists the pages contained within your website. You can exclude pages from this navigation if required. You can also reorder pages from the default alphabetical scheme. If your website contains subpages, these may come up as a drop down menu when hovering over the ‘parent’ page, or may be listed directly underneath. This lists the categories associated with your posts. Clicking on one of these categories takes you to a page that lists all the post assigned to that category. This can display a text title, logo or both. 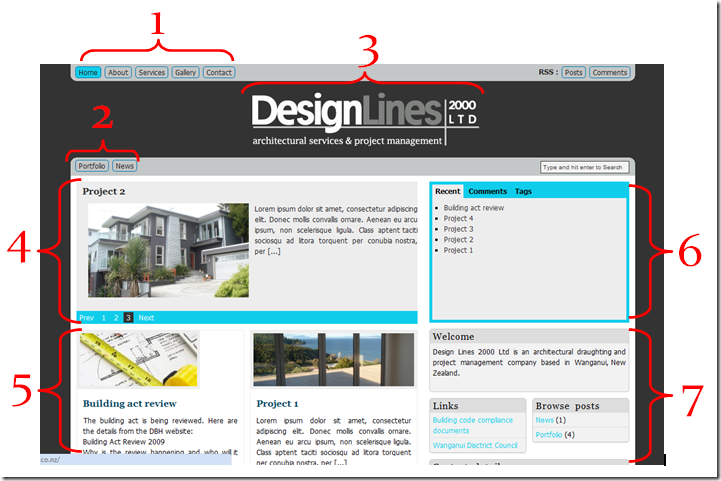 A text title can be changed easily at any time, however changing a logo may involve theme customisation if the built in theme options do not allow it. The featured content slider shows a defined number of latest posts. It showcases an image from the post, and the first part of the post text content. The featured content slider can be filtered to just show posts from one category. This one is just showing posts from the “portfolio” category. Readers will click on the post title to read the full post. In this theme, your latest posts are shown on the home page. This shows an image, plus the beginning of your text content. Readers will click on the post title, or the ‘read more’ link underneath the text to go to the page for that post and read the full story. This box contains three tabs. On the first tab named “recent”, a basic list displays your recent posts from all categories. On the second tab named “comments”, any recent comments will be listed. On the last tab named “tags”, a “tag cloud” is shown containing all the tags that you have used for your posts. The more you use a tag, the larger that tag will be displayed. Readers can click on these tags which will take them to a page that lists all the posts tagged with that particular tag. Widgets are small ‘features’ that you can put onto your pages. They can be as basic as a text widget (shown here under the ‘welcome’ heading), or more complicated such as a Twitter widget, which can display a short list of your recent ‘Tweets’. On this page we also have a ‘links’ widget box and a ‘posts’ widget. The posts widget has links to your post categories, just like the posts navigation near the top of your page. Log in to your WordPress admin area. This is located at http://yourdomain.com/wp-admin. There may also be a link on the page under a “meta” heading for logging in. To update or edit a static page that already exists, click on the ‘pages’ link at the left. You will now see a list of all your pages. To edit a particular page, either click on that page heading, or hover over the heading and click on the ‘edit’ link. You can then freely edit the text. Use the tool buttons along the top to make text bold or italics, add lists (bulleted or numbered lists), add quotes and change text alignment. To add further elements like headings, or change fonts and text colours, click on the ‘show/hide kitchen sink’ button to show more options. Before saving your changes, you can preview the page by clicking on the ‘preview changes’ button from the ‘Publish’ menu at the right. When you are satisfied, click the blue ‘update page’ button. If you want to take a page offline, without deleting it, you can change the visibility from ’public’ to ‘private’ or if you want to put a password on it, change to ‘password protected’ and give it a password. To add a new page, click on the pages menu from the left and click the ‘add new’ link. Give the page a title, and add text and edit as explained above. You will see a ‘save draft’ button in the Publish menu, which allows you to save your new page, without publishing it right away. Once you’re ready to publish, click the blue ‘publish’ button. Once the page is published, the button changes to an ‘update page’ button. 1. Click on the ‘posts’ menu at the left then click ‘add new’. Give the post a title – nothing too long as the title becomes the link to that post (i.e. http://yourdomain.com/posts/new-post is much better than http://yourdomain/posts/this-is-the-newest-post-for-now). Add and edit text as explained above, you can also add images the same way you would for pages. The Publish menu also works the same. 2. Add some tags to the post. Under the ‘Post Tags’ menu at the right, type in your tags, separated by commas and click add. You can also click the ‘choose from the most used tags in Post Tags’ link and click on previously used tags that you want to add to this post. 3. File under a category. Select an existing category from the Categories menu at the right. If you want to create a new category, you can click on the ‘+ Add New Category’ link underneath the category list and type in the name of your new category. If it is to be a subcategory of an already existing category, choose the parent category and then click add. 4. Save your draft, or click publish. Select ‘Posts’ from the left hand menu, click on the post title (or click edit underneath the post title) and edit as described above. You can add new tags, or delete current ones, change categories or change the visibility of the post. Note: Images should be resized prior to uploading them to your WordPress site. This is to save space and page loading times. 1. From a new post/page or an existing post/page, use the ‘Add an image’ link to add a new image. 2. This opens a new window. Use the first tab to upload a file from your computer. 3. Give the image a title, caption and description. These details will come up either underneath the picture or when you hover over the image. 4. In the link URL box, enter the URL you want the image to link to when readers click on it. Click the ‘File URL’ button if you want it to link to the image location – this will display the full size image in a new page. Alternatively enter a link for another web page you might want to link to. 5. Choose the alignment and size of the image. Avoid using full size images in posts as this may cause formatting issues. 6. Click the ‘Insert into Post’ to insert the image into your post/page. Clicking the ‘Save all changes’ button won’t insert the image, but it will save it in your media library with the details you have specified. If you want to insert an image you have used in a previous post or page, click on the ‘add an image’ button and then click on the Media Library tab. Click ‘show’ beside the required image and edit the details as above and click ‘insert into post’. To edit an image in a post or page, go to the post/page, click on the image and click the ‘edit image’ icon that comes up on top of the image (or click the delete icon to delete the image). You can then edit the size, title, description etc. Click ‘update’ once finished. The featured content slider automatically shows the latest posts and can be filtered to a specific category. In this example, only the posts from the ‘portfolio’ category are shown on the slider. The slider shows the first image from the post, along with a snippet of text from the post. Whenever a post or page is updated, WordPress saves the previous version in case you make a mistake. It also autosaves posts in case you forget to save. If you need to revert back to one of these versions click on one of the links under ‘post revisions’ at the bottom of the edit page. It tells you the time, date it was created and by whom. After clicking on the previous version, you can compare it with the current version to see what the differences in content are, or restore it to a previous version. By default, 9 previous versions are saved. If your site has a ‘links’ widget, you can add or delete links as you see fit. Click on the ‘links’ menu at the left, and click ‘add new’ under this, or click on the link title to edit. Links can also be assigned to categories and only certain categories displayed in the widget. In this case, links added to the ‘links’ category are displayed, and links added to the ‘blogroll’ category are not displayed. Readers can add comments to your posts and also to your pages (unless comments have been disabled on the page). When a comment is added, you will receive an email. 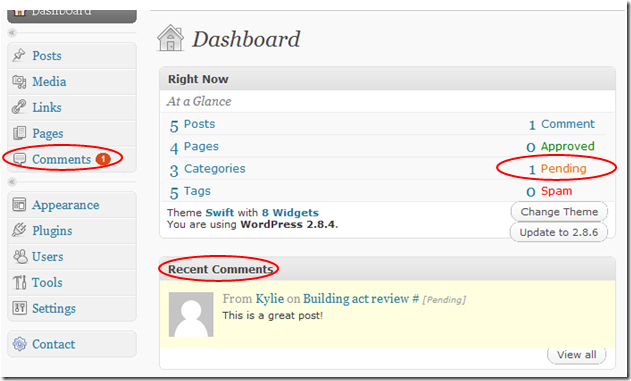 Log in to your WordPress admin area (http://yourdomain.com/wp-admin) to review the comments. 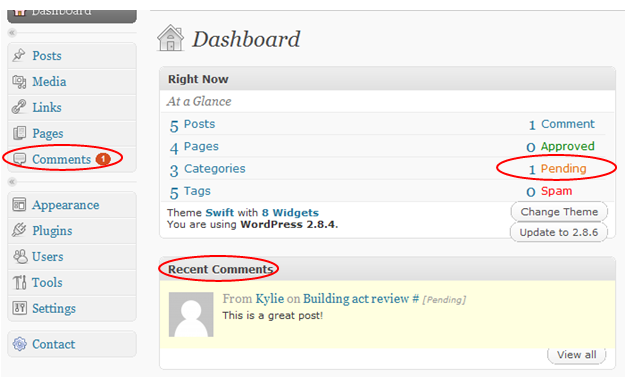 If you have comments that are pending approval they will show up on your dashboard as per below. It will also come up as a recent comment below the ‘right now’ menu, and the number of pending comments can also be seen at the left beside the ‘comments’ link. These three areas are highlighted in the image below. To instantly approve or reject the comment, you can hover over the comment under ‘recent comments’, and click on approve, delete, edit, or mark it as spam. Alternatively, you can click on the comments, or pending links, and then hover over the comment and approve, delete, edit, or mark as spam as above. You can also post comments yourself on your own pages or posts. Just visit the post/page and fill in the comment box at the bottom.